After failing at baking with tea yesterday, I found myself home for the day. (Note to self, having low bold pressure is great, except when you’re being shot up with pneumonia, and then it makes you extremely doing hotheaded.) After sleeping for most of the morning, I decided to get on with the things I didn’t get done around the house this weekend. 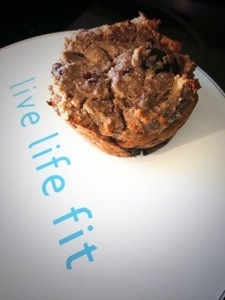 First up: more protein muffins. As I mentioned yesterday, my visit with Juliet Burgh, the dietician at Unite Fitness, went well. But I need to continue to find yummy, yet healthy, foods that make me feel like I’m cheating, even if I’m not. 1) Heat oven to 350 degrees. Mix all dry ingredients into a large mixing bowl. Mix all wet ingredients into a smaller bowl. 2) Combine wet and dry ingredients and mix until thoroughly mixed. 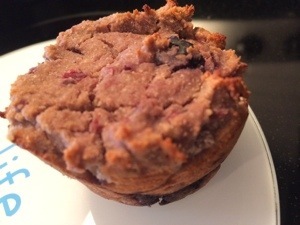 3) Scoop mixture into muffin tins that have been sprayed with coconut oil. Put into oven for 25 minutes. 4) Cook until browned on top, and toothpick comes out just slightly damp. Do not overcook. They quickly become dry and brittle because there is no added oil.